Storms or natural disasters can have the ability to knock your power out for an extensive period of time. During an outage, portable generators can offer temporary power, but there are potential risks associated with the use of these generators. Generators can be dangerous, and can lead to illness and injury, and even death if used improperly. Use caution when touching your generator as many areas become hot and can harm you. At the low end of the cost spectrum, small “portable” and self-contained diesel generators with internal fuel tanks are an option chosen by some residents who are willing to put up with inconvenience of manual operation and anticipate being home at the time of the power outage. Such “portable” units are about the size of a wheelbarrow, are usually mounted on wheels and can be rolled short distances; they are a common sight at construction sites. In many ways they are similar to a gas lawnmower with an electric starter and can be stored in a garage. Most generators of this type will run less than a full day on a tank of gas, requiring the resident to refill the gas tank at least once or twice a day by pouring in gasoline from a typical five gallon jerry can that must be refilled at a gas station. The generator cannot be run inside the garage safely. 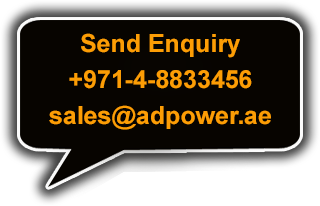 Adpower generators are becoming the most dependable and cost-effective power supply solution of choice. For instance, as many telecom applications involve remote sites, the proven performance of generator technology is essential. The low maintenance requirements of Adpower generators are a distinct advantage as site visits can be reduced to coincide with the annual preventive maintenance cycle of the telecom equipment.